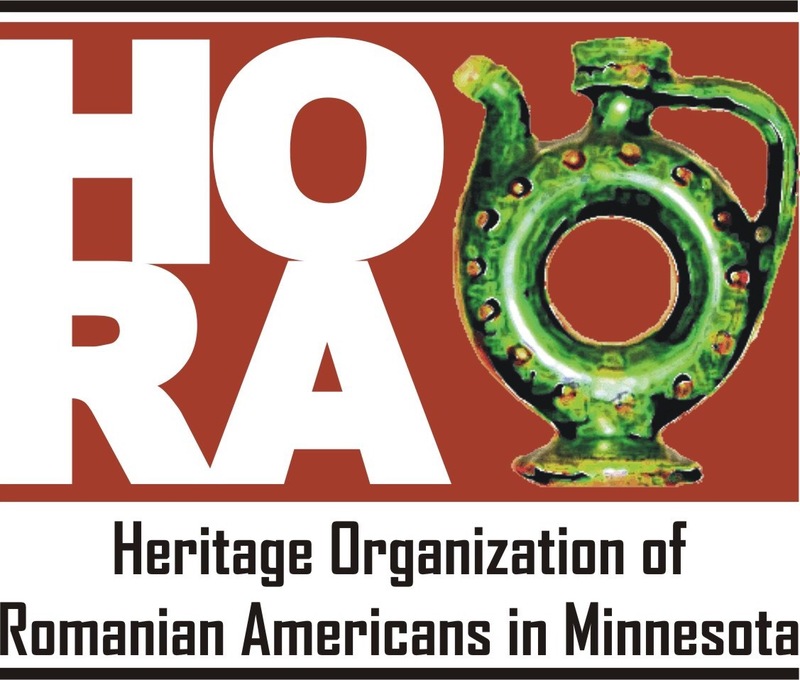 Minneapolis, MN (November 1, 2017) – The Heritage Organization of Romanian Americans (HORA) proudly presents The Romanian Colinde Concert, a concert of enchanting carols and old-world traditions featuring Balkan band Orkestar Bez Ime, percussionist Peter O’Gorman, Romanian choreographer John Omorean, and Minnesota’s Romanian community choir, Chorus Ciprian Porumbescu. Premiering new arrangements of ancient Romanian carols written by Colleen Bertsch. Saturday, December 16h, 2017 at 5:00 pm at St. Mary’s Greek Orthodox Church in Minneapolis. 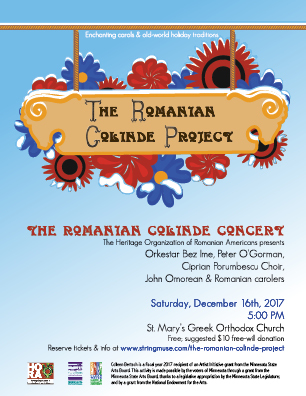 Immediately following the concert, HORA invites the audience to stay and partake in their annual Romanian holiday party. Please bring a dish to share. RSVP for after party is required at buytickets.at/stringmuse. A long and vital Romanian tradition, singing colinde is a centuries-old caroling tradition that is listed on UNESCO’s World Heritage list of Intangible Cultural Heritage of Humanity. The Romanian Colinde Concert will debut new Romanian carol arrangements written and orchestrated by violinist-arranger Colleen Bertsch for Orkestar Bez Ime and Chorul Ciprian Porumbescu. The concert will also highlight new pieces for toacă (semantron), shouts, and dance created by Peter O’Gorman and John Omorean. The toacă that O’Gorman will be performing on is a replicate of the Orthodox wooden planks used for centuries to call the community to prayer. This particular instrument was designed and built by NE Minneapolis artist-musician Dean Hawthorne of Savage Oral Hotbed. Colleen Bertsch is the founder of The Romanian Colinde Project and is available for an interview. You may contact her to set up a time that is convenient. To learn more, please visit The Romanian Colinde Project’s Facebook Page at www.facebook.com/ColindeProject/ and the Heritage Organization for Romanian Americans’ website at www.hora-mn.org. Saturday, December 16th, 2017 at 5:00 PM. St. Mary’s Greek Orthodox Church, 3450 Irving Ave South, Minneapolis, 55408. Tickets are free; a suggested $10 free-will donation is encouraged. Reserve your ticket at buytickets.at/stringmuse. Peter O’Gorman is a composer-percussionist whose compositions have been performed by the Bang on a Can All-Stars, Amy Knoles, and Ethos. He is a recipient of two McKnight Composer Fellowships (2010 & 2015) and has been supported by the American Composers Forum, the Andrew W. Mellon Foundation, the Goodale Family Foundation, the Jerome Foundation, and the Walker Art Center. Peter’s expertise as an interdisciplinary collaborator has led him to create and perform with numerous choreographers and movement based composers including Mary Ellen Childs’ CRASH, Joe Chvala and the Flying Foot Forum, Carl Flink’s Black Label Movement, Wynn Fricke, Vanessa Voskuil, the American Dance Festival, Minnesota Dance Theatre, and Zenon Dance Company. John Omorean is a dancer-choreographer who specializes in Romanian folk dance. He is the director of Izvorașul, Plai de dor, and Dunarea dance ensembles in St. Paul. John earned a research certificate of Linguistică si Dialectologie, specializing in Romanian strigături (extemporaneous chants) at the Institute of Folklore and Ethnography at the University of București. Yet, John considers his field research with Romanian villagers to have had the greatest impact on his artistic work. He has created Romanian folkloric choreographies for Ethnic Dance Theatre and Mixed Blood Theatre of Minneapolis, Viața Romaneasca Ensemble of Milwaukee, Komenka Dance Ensemble of New Orleans, and The “Banațul” Romanian ensembles of New York, Windsor, Chicago and Detroit. Dean Hawthorne is an artist and fabricator living in NE Minneapolis. He spent one season as the Associate Prop Master at the Guthrie Theater and worked for many years as the Prop Master for the Minnesota Opera. Most recently he was an Exhibit Fabricator for the Science Museum of Minnesota. Past collaborations include work with Joe Chvala and the Flying Foot Forum, Zenon, Paula Mann, Karla Grotting, Sally Rousse, and Peter O’Gorman. He is a percussionist with Savage Aural Hotbed, and with his partner Kate Sullivan, co-owns and operates 2001 A Space in NE Minneapolis. Dean is delighted to be working on the Colinde Project. Colleen Bertsch is a fiscal year 2017 recipient of an Artist Initiative grant from the Minnesota State Arts Board. This activity is made possible by the voters of Minnesota through a grant from the Minnesota State Arts Board, thanks to a legislative appropriation by the Minnesota State Legislature; and by a grant from the National Endowment for the Arts.